We provide comprehensive restorative dentistry to Pennsylvania by offering professional quality dental implants. 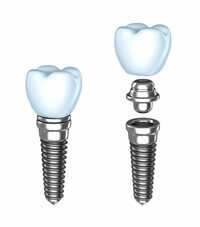 A dental implant is a permanent tooth and root that is substituted for a missing tooth. The root portion is made from titanium and integrates naturally with the bone in your jaw through a process called Osseo integration. 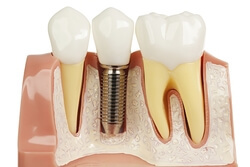 Once the implant has fused to your jaw bone, it prevents bone loss you would normally experience from a lack of stimulation from your organic tooth root. The crown that is placed on top of the titanium root is made to be durable and to blend in with colouring of your existing teeth. Should I get a Dental Implant or a Fixed Bridge? Just a few years ago, the best solution for one or more missing teeth was a fixed bridge. Existing teeth surrounding the space where a tooth used to be are used as anchors for attaching replacement teeth. The fixed bridge method does nothing for the health of the bone in your jaw and can cause damage to the natural teeth that are supporting the replacements. While both a fixed bridge and a dental implant are permanent fixtures, a dental implant is a permanent way to restore missing teeth that is also great for your overall oral health. If your dental issues are more complex and involve the position of your teeth, we offer procedures that can help. The process of getting implants requires a number of visits over several months. X-rays and impressions (molds) are taken of the jaw and teeth to determine bone, gum tissue, and spacing available for an implant. While the area is numb, the implant will be surgically placed into the bone and allowed to heal and integrate itself onto the bone for up to six months. Depending on the type of implant, a second surgery may be required in order to place the post that will hold the artificial tooth in place. With other implants the post and anchor are already attached and placed at the same time. After several weeks of healing the artificial teeth are made and fitted to the post portion of the anchor. Because several fittings may be required, this step may take one to two months to complete. After a healing period, the artificial teeth are securely attached to the implant, providing excellent stability and comfort to the patient. Are you ready for a Dental Implant Consultation? If you are interested in getting dental implants, please call us at (610) 454-7991 or schedule an appointment online!